Food Technology teachers from local schools visited Brockenhurst College recently for a food demonstration event that focused on recipes for people with special dietary requirements. 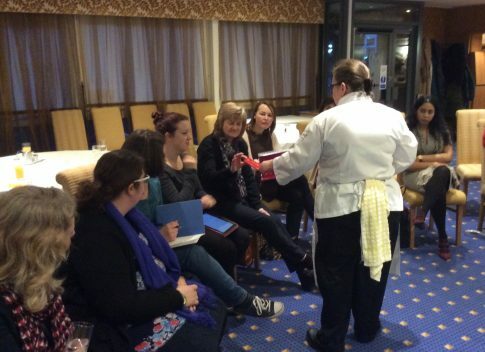 The teachers were treated to an evening of supper and networking, followed by the demonstrations, some tasting, and a Q&A session. The initiative’s aim was to share knowledge about how traditional dishes can be adapted without radically changing the taste and texture. Brock lecturer Sarah Smith showed how to make a range of different foods to accommodate those with gluten-free, dairy-free, egg-free, nut-free, and vegan diets. By substituting traditional ingredients with suitable alternatives, Sarah made a dairy-free crème brûlée from almond milk, jelly using agar from seaweed, and chocolate brownies that contained banana instead of egg. The star of the show, however, was a meringue that was made using the liquid from a tin of chickpeas instead of egg white. Feedback from teachers was very positive, with Anne Harding from The Mountbatten School in Romsey describing the demonstration as “amazing, interesting and inspiring”. Hospitality lecturer Cathy MacArthur said: “This was an opportunity for us to network and build relationships with the schools. It also gave the teachers more of an idea about the things we cover here.”.